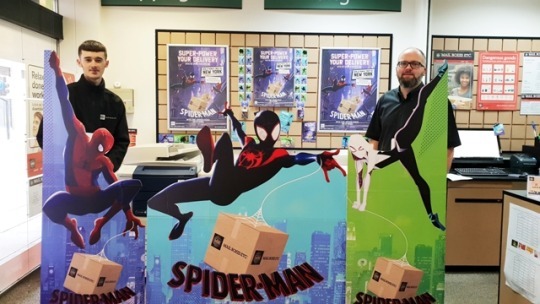 The long-awaited, incredible new animation, Spider-Man: Into the Spider-Verse opens in cinemas on 12 December and retail post, parcel and print specialist Mail Boxes Etc. is one of the leading brands working with Sony Pictures to help promote the movie in the UK and Ireland. Spider-Man: Into the Spider-Verse introduces Brooklyn teen Miles Morales as the all-new Spider-Man, and the limitless possibilities of the Spider-Verse, where more than one can wear the mask. To celebrate the launch of the film, MBE is offering customers the chance to enter a free prize draw to win a family trip to New York City, where the film’s action is set. The winners will check into their luxury hotel for a four-night stay and enjoy all the sights of Spider-Man’s hometown, including a superhero-sized feast at NYC’s comic book-themed restaurant. The competition is free to enter and no purchase is necessary. Runner-up prizes include Spider-Man goodie bags, supported by movie-related pairs cards, postcard sets and calendars, given away in participating MBE stores. There’s also weekly prize draws on social media. MBE has more than 150 high street stores in the UK and Ireland, providing plenty of retail locations and a healthy footfall that’s ripe for displaying the Spider-Man promotional material to customers and passers-by. “We’re hoping that customers visiting their local Mail Boxes Etc. will be impressed by the colourful store displays. And in the run-up to Christmas we have free Spider-Man calendars to give away that will help focus customers’ minds on print,” continues Simmons. Neil Moore, who with his wife Tracey owns the Mail Boxes Etc. store in Plymouth, is using the promotion to demonstrate how to use traditional print in creative ways. 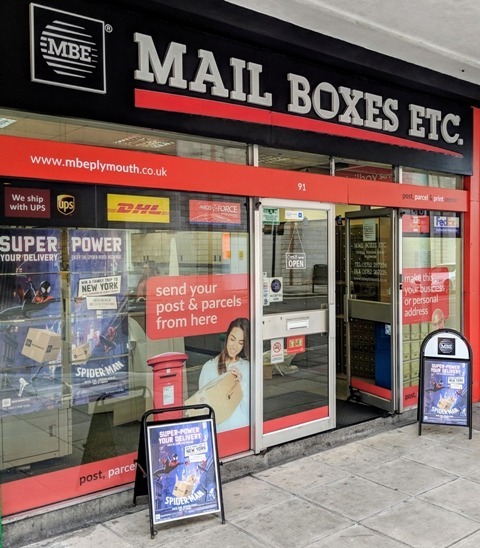 With more MBE stores investing in graphic designers to help bring customers’ ideas to life, franchisees are increasing sales of digital print and finishing services in-store, as well as raising awareness of MBE’s post and worldwide parcel delivery solutions. Spider-Man: Into the Spider-Verse opens in cinemas across the UK and Ireland on 12 December, with previews on the weekend before. To enter MBE’s prize draw, go to www.mbe.co.uk/spider-man. No purchase necessary. Full terms and conditions are available online.